This book and I didn't have the smoothest start. It has more than its fair share of time travel cliches. Titanic, Nazis, the Kennedy assassination... Not the most original stomping grounds for time travelers. And then the character from 1912 hears somebody say "time travel" and says, "What's time travel?" And I facepalmed. At this point, I didn't have high hopes for this book. Luckily, it all improves from there. Despite an unimaginative choice of time travel destinations, the way that time travel is actually handled is done in a way that's interesting and, to my mind, fairly original. It also seems to have been executed with a great deal of forethought. The stakes feel very real, and very urgent. And the characters themselves were done better than I'd been afraid they would be. 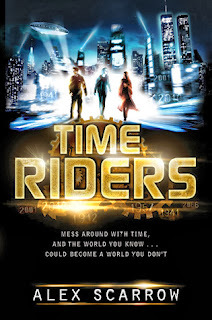 They're all new at this whole time travel business, of course, but they're all bright enough, brave enough, and competent enough at the beginning to make it believable that they can become the time travel cops they were chosen to be. And guess what? No romance! I have to say, I was surprised by how much I ended up liking this book, despite a less than promising start. I'm not sure yet if I'll read any further in the series, but this was a solid start.